When Zoe’s best friend Kate dies of breast cancer, her whole world is turned upside down. Within hours, she goes from being the wacky neighbour who can barely keep a houseplant alive to a whole new world of responsibility when she realises she’s guardian to Kate’s 16-year-old daughter, Martha. I’ve read and enjoyed every book in this series so far, so it comes as no surprise that I was keen to read Coming Home to the Comfort Food Café, the third instalment by Debbie Johnson. Opening with a heartfelt letter from her best friend, Kate, the tone is melancholic as we learn that protagonist Zoe has been entrusted with caring for Kate’s sixteen-year-old daughter, Martha. This is the result of Kate passing away from cancer a few months ago, starting Martha off on a trail of self destruction. She is out drinking and smoking with her friends, sneaking out and leaving Zoe to frantically search the town for her in a desperate bid to save her from herself. Zoe loves Martha like her own, but she was never ready for children of her own, let alone any other type of commitment. She is trying her best at guardianship, but feels like they are moving in circles and never moving forward, forcing her to consider a drastic change. After a spot of internet searching, Zoe discovers Budbury and rents a holiday cottage, thinking time away from town and the bars will help to stop Martha’s wayward behaviour – cue a teenage tantrum of epic proportions. Sticking to her guns on this one, Zoe packs their life into the car and keeps her fingers crossed that Budbury will answer all her prayers. It is here that they discover the Comfort Food Café, and meet the other residents who have each found solace in this seaside community. Martha may be reluctant at first, but Zoe feels sure she’s made the right choice. However, how will she feel when Martha’s Australian dad, Cal, makes an appearance in her life for the very first time? As with the previous instalments to this series, there is a feeling of coming home or pulling on a warm blanket, as all the characters and settings instantly feel familiar. Zoe seems to fit right in, finding that the other residents have had problems at least as bad as hers if not worse, offering her valuable guidance on how to deal with Martha. It is the added introduction of Cal that threatens to disrupt everything, as Zoe knows blood is thicker than water and fears that he might take Martha away from her care. I found that Zoe was very easy to like, and the effect of losing her best friend has been pushed to the back of her mind while she tries to be the best she can for Martha. There is the sense that she hasn’t had time to process all she has lost, and that she no longer feels as though she can put herself first. She is very understanding, having been a wayward teen in her own youth, but still harbours insecurities about her own worth and how others perceive her. Cal’s arrival makes her head spin, as she is unsure whether his presence is good for Martha’s emotions, and she is struggling to admit that she is also attracted to him. This romance is a slow burner, with Cal initially seeking Zoe’s advice on Martha’s likes and dislikes, then finding that he enjoys both of their company. His interactions with Zoe are easy-going and he is less fearful of what could happen between them. All he and Kate shared was a one night stand, so there is never a risk of lingering feelings getting in the way and he is keen to explore their connection. However, I liked that he never tries to push Zoe into anything, willing to take things at her pace or not at all if she doesn’t feel the same. 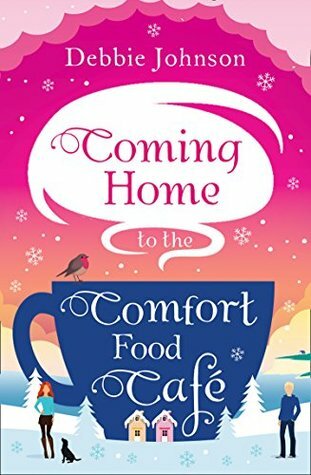 To conclude, I loved my return to the Comfort Food Café just as much as the times before, with the familiar faces adding to the overall cosy feel of the book. The prose is easy to read and quick to devour, as you become keen to know what the future holds for Zoe and Martha, and whether their time by the beach can alleviate their grief and help them to move forwards.